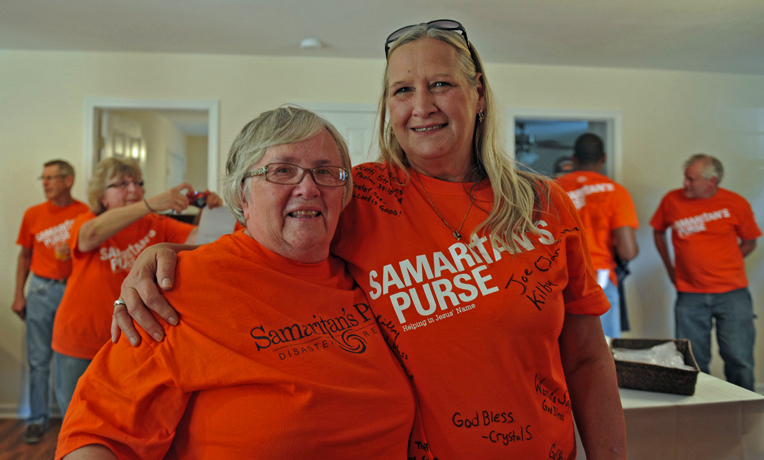 Sharon Fuller is one of the Samaritan's Purse volunteers who signed Fran Gill's shirt after working on her new home. When the drywall went up a few months ago, it marked another step in recovering from the tornado that destroyed Fran Gill’s house last May. But there was a problem. “They couldn’t sign anything,” she said. The Samaritan’s Purse volunteers who had been coming to Oklahoma to help build a new home for Fran had been writing messages, prayers, and Scripture all over the frame, clear up to the roof. To Fran, the notes and signatures represent the goodness of God and the body of Christ. So when the studs were covered by drywall, she came up with an alternative. She announced her plan one night while having dinner with the volunteers at the host church. That week, an orange Samaritan’s Purse disaster relief T-shirt peppered with signatures, Bible verses, and well wishes became the first in Fran’s collection. “It’s something I wanted to remind me about what God’s people can do,” she said. God’s people have been an answer to Fran’s prayers since the terrible storm severely battered her home on May 20 last year. Fran is ready to move into her new home with her daughter, Missy, and grandchildren Zachary and Alissa. The bathroom floor gave way, so she put down plywood to walk to the sink. The poor condition also made it hard to keep possums and other critters out. Michael Todd, Samaritan’s Purse program manager for the Central Oklahoma rebuild, met Fran in her home last December. Fran couldn’t afford repairs on her home of 23 years. When she found out the house was condemned and she needed a new home altogether, it was overwhelming news. God had never let her down. After placing her faith in Christ 30 years ago, Fran turned from drugs and alcohol, sold her bar, and bought the piece of property and house where she raised her family. Her home became a haven for mentoring young people and hosting activities. She led youth ministry for dozens of churches in the region. When she was recently diagnosed with cancer, it became the place her daughter and son-in-law returned to live and take care of her. She saw Him work again in January, when Samaritan’s Purse began building her a new house, free of charge. 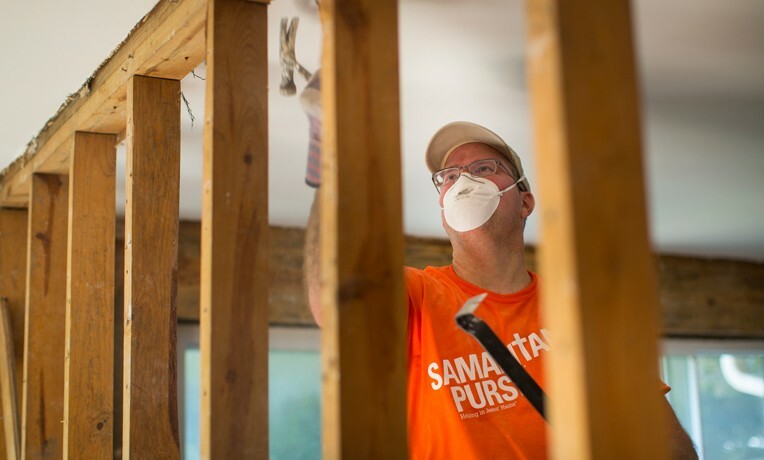 After the EF5 tornado ripped through Moore, Oklahoma, last year, thousands of Samaritan’s Purse donors and volunteers answered the call to help victims pick up the pieces and start over. We responded in the immediate aftermath of the storm, and helped over 600 homeowners by clearing debris, cutting trees, and tarping roofs. We then began a program to rebuild and repair homes, and to install storm shelters to provide safety and comfort the next time a storm strikes. Fran’s home is the first to be completed from the ground up. Volunteer Sandy Kegel and Fran Gill plant flowers in her front yard. The original plan was to build a two-bedroom house. When her daughter and son-in-law came back to care for Fran, the plan changed to a three-bedroom. Then, Fran’s two teenage grandchildren moved in. We modified the floor plan again to accommodate four bedrooms and two bathrooms. Michael’s team welcomed the opportunity to enable another first: the first time the family will live together in their own home. “It was just a privilege to be able to do that for that family. God worked it out,” he said. During construction, the Gills lived on the property in a small, donated RV and helped every chance they could—from the foundation to the finishing touches. One of Fran’s favorite memories is helping to raise the first wall. But most of all, she loved spending time with the volunteers. Over 160 people from 24 states came to work on her house. Sharon Fuller from Elmbrook Church in Brookfield, Wisconsin, helped put up the first wall together with Fran in May. She has traveled three different times to work on the house, and her eyes well up when she talks about it. 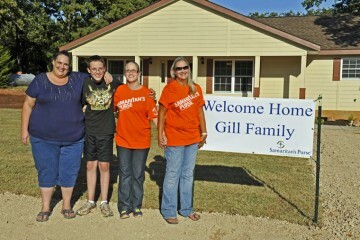 Sharon’s third trip included the completion and dedication of the Gill’s home on Oct. 24. Fran welcomes the first guests into her new home. At the dedication, Samaritan’s Purse staff members presented Fran with a Bible signed by volunteers, a journal, the keys to her new home, and a framed certificate testifying that it was paid-in-full. Pastor Frank Miller from Church of the Harvest asked God to bless the house, and there was a time of worship. Then, volunteers, neighbors, future homeowners, and other members of the community stood in the sunshine on Fran’s lawn while she spoke tearful words of gratitude on behalf of her entire family. After the ceremony, Fran led her family into their new home, complete with hardwood floors, black laminate countertops, and most important, a laundry room and bathroom that doubles as a storm shelter. The guests attended a reception in Fran’s living room, while her grandchildren showed volunteers their new rooms several times. Fran’s daughter, Missy, said the house looked gorgeous. “It’s almost unbelievable to think that people that don’t even know you, do this for you,” she said. And after sharing a room with her two kids for months, she is grateful that she and her husband finally have a space of their own. Michael said it has been a blessing to watch God work in Fran’s life. 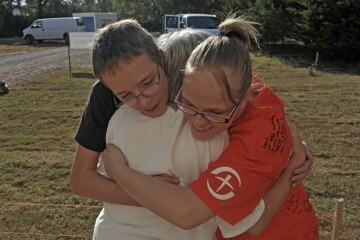 Fran’s grandchildren hug Georgia Meyers, whose new home is currently under construction. 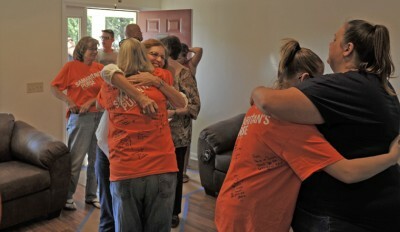 Fran and Georgia’s families have become close friends through our rebuild program. “Just seeing the difference in her since the first time I met her, just how the love of Christ has been poured into her and into that home—that won’t burn out. That’s going to be a lighthouse, a beacon back there on that lot for the family and really for anybody that passes by,” he said. Fran served cupcakes in the kitchen while wearing the final shirt “from the backs” of the volunteers who celebrated the new beginning with her. The Samaritan’s Purse Central Oklahoma rebuild team continues to work on houses and storm shelters for victims of the May 2013 tornadoes. Our desire is for homeowners to stand firm in Christ no matter what storms come their way.